Editor of the Beckford Journal. Jon Millington is a member of the Council of Management of the Beckford Tower Trust and wrote the guide to the Tower at Bath. He is interested in all aspects of Beckford, and particularly in books relating to him, including those from his library and biographical studies. For the 1976 William Beckford Exhibition in Salisbury and Bath he produced the slide show and contributed to the catalogue the essays 'Man of Letters' and 'Bibliophile Extraordinary'. To mark the 150th anniversary of Beckford's death he devised the exhibition Souvenirs of Fonthill Abbey, for which he also wrote the catalogue. In 2001, he published the bibliography Beckford and his circle in the Gentleman's Magazine (ISBN 0-9537836-1-8). He edited the Beckford Tower Trust Newsletter from 1980 to 1994 and since then has edited its successor, The Beckford Journal. This is published annually by the Beckford Society, and the Editor is happy to consider articles on Beckfordian matters for publication. A complete index of the Beckford Tower Trust Newsletter (1980-1994) is found here. A complete index of the Beckford Journal (1995-2000) is found here. A list of the contents of the Beckford Annual Lectures Volume can be found here. A checklist of engravings of Fonthill, originally published in the Beckford Journal, can be found here. 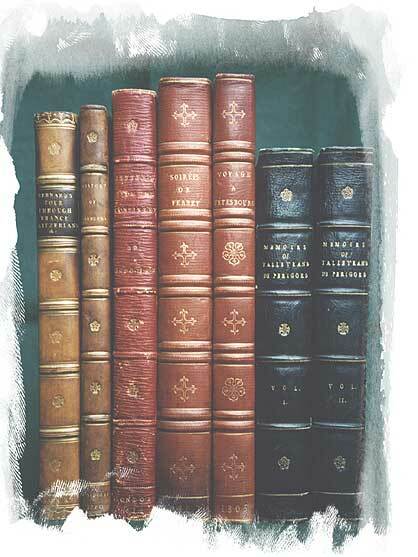 A collection of "Fonthills" from Beckford's library.